Auckland - South Africa failed to chase down an opposition total for the second time in the cricket World Cup on Saturday to resurrect old doubts about their ability under pressure. Captain AB de Villiers did his best to win the Pool B game against Pakistan on his own as wickets fell at the other end but his dismissal for 77 signalled the end of South Africa's challenge. Pakistan eventually won the match by 29 runs on the Duckworth-Lewis method after South Africa collapsed to 202 all out from 33.3 overs. They lost an earlier group game to India by 130 runs. It was also the second match in a row at Eden Park to be dominated by the bowlers after last weekend's epic one wicket win by New Zealand over co-hosts Australia. 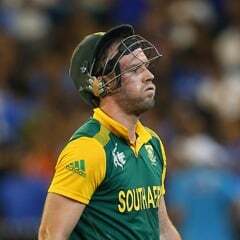 "It was a disappointing loss once again," De Villiers told reporters. "We didn't have good enough partnerships. I think Pakistan wanted it more than us"
De Villiers said he had not felt any energy from his team before the match. "I didn't feel any electric vibe," he said. "It's my responsibility to get the guys going which I didn't. They weren't prepared to fight. "I firmly believe there's nothing wrong with the batting line-up, nothing wrong with the cricket team. I don't feel there any scars." De Villiers said he also believed his team should have been able to chase down 300 on Saturday, despite rain interruptions which freshened the pitch for the Pakistan fast bowlers. "There was a bit of juice there," he said. "But there were too many soft dismissals. I've just got nothing good to say about our performance today. "I'm still excited about the ability of the players around me. I know we can win the World Cup."